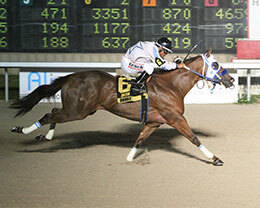 Zenergetic, under jockey Luis Vivanco, easily winning the $28,000 Mothers' Day Stakes Saturday night at Delta Downs. VINTON, LA�MAY 11, 2018�Zenergetic found herself right at home Saturday night in the $28,000 Mothers' Day Stakes at Delta Downs. Making her first start on the Louisiana track's racing surface she turned the tables on rival Marfilious by easily winning the event for 3-year-old and up fillies and mares by one-length. A month ago the pair faced off in the $20,000 Miss Sam Houston Stakes at Sam Houston Race Park with Marfilous secoring a headbob over Zenergetic. Regular rider Luis Vivanco rode the daughter of DOMINYUN to a :17.375 clocking over the 350 yards, a 98 speed index. Trainer Trey Ellis saddled the 5-year-old to her fifth career win for owner Zenergetic Group. Bobby D. Cox bred the multiple stakes winner in Texas from the First Down Dash mare Zenergy. Zenergetic has compiled a (23) 5-5-4 record and used the $15,000 Mothers' Day winner's purse to boost her earnings to $72,528. Coming off a win in the Miss Houston Marfilous picked up $5,000 for her second-place effort. Josue Ponce trains the IVORY JAMES filly for owner Ruben Garcia Montemayor. Damian Martinez rode the Bobby D. Cox Texas-bred out of Versace by Ocean Runaway. She has earned $59,859. Louisiana-bred Eyesa Game finished three-quarter back to pick up $4,400 for third. Lanny Keith conditions the Touchet Farms LLC owned 3-year-old daughter of multiple stakes sire Game Patriot from the Mr Eye Opener mare Eyesa Beauty 123. Everado Rodriguez was riding. Lee and Sandra Stevens are the breeder. Rf A Faster Chick, Jess Toastem, Cajun Diva, Vfgo Max Go, Okey Dokey Diamond and Shes A Tourist completed the field.